Happy Grab Some Nuts Day! No, I'm no kidding and I'm not nuts. Well...um...not completely. Anyway, yes this is an actual holiday, people. Nuts are good and healthy and delicious and we're celebrating them. By now you should know that my fellow food bloggers and I can't resist these wacky holidays and had to come up with nutty recipes to honor the occasion. When I was thinking of what to contribute to the nut party, I started by having a look in my freezer. I keep nuts in there, right next to the vodka and the cocktail glasses. What? What do other people keep in their freezer? Seriously, nuts are full of oil that can get rancid so keeping them frozen extends their life. They're also pricy so look for sales and specials. You should see the industrial sized bag of walnuts we have in there now. Tucked behind the walnuts, though, was a sealed container of plain peanuts. Sometimes it's hard to find the plain ones and especially at a good price so I grabbed them when I found them. Have you ever noticed that when there's a bowl of mixed nuts out at a party, people eat around the peanuts? I'll be the first to admit that I am a cashew monster and I'll empty those out of the bowl in record time. But I will also happily eat the peanuts and I usually get most of them to myself. I love peanuts and they are also the base of one of my favorite foods on earth, peanut butter. What better way to celebrate the nuts than by making a nut pie. 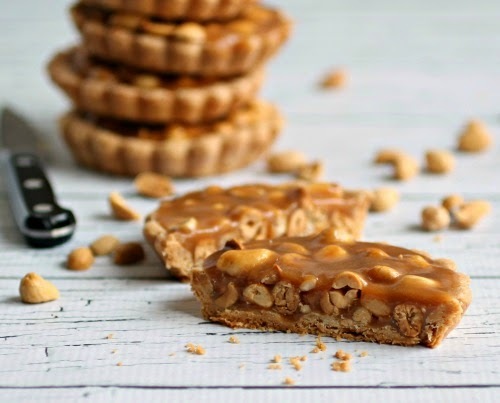 Peanuts in the crust, peanuts in the filling, peanut butter in the caramel. I went totally nuts! OK, I'll stop now. 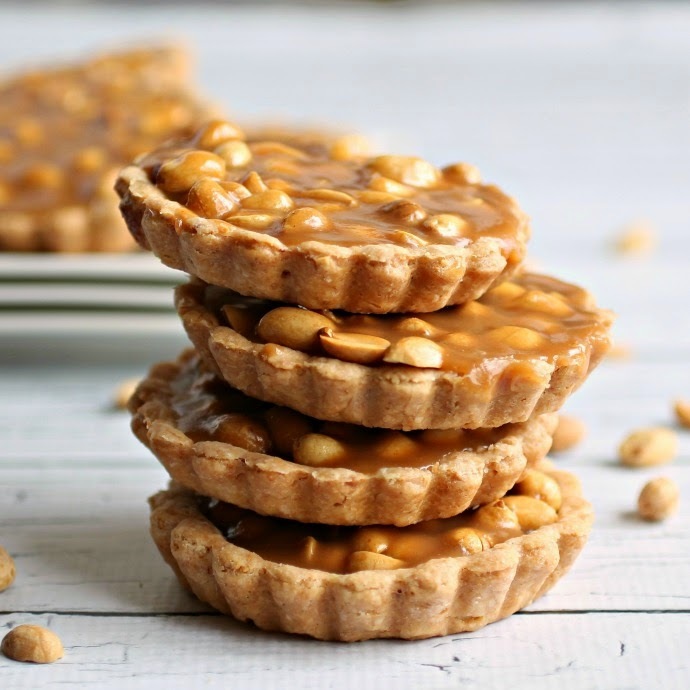 Go make this because it's ridiculously good and then check out the other nutty offerings from my fellow nuts...er...bloggers. Enjoy! To make the crust, add the flour, peanuts, salt and baking powder to a food processor. Pulse a couple of times to coarsely chop the nuts. Add the butter and pulse a few times, just until the mixture resembles coarse crumbs. With the food processor running, slowly add the water and continue mixing until it forms a dough ball. Wrap the dough in plastic and refrigerate for at least 30 minutes. Roll the dough out on a floured surface. You can make a 10" circle and drape it into a 9" tart pan or make 8 individual 4" tarts, as I did. Prick the dough a few times with the tines of a fork and fill each shell with pie weights or dry beans. Bake in a pre-heated 350 degree oven for 30 - 40 minutes or until the edges are a light golden brown. Remove the pie weights and allow the pie shells to cool completely. Make the sauce by melting the sugar in a pot over a low to medium flame. Do not stir. When the sugar has completely dissolved, remove it from the heat and add the heavy cream. The mixture will bubble up. Return to a low heat and stir vigorously until all lumps are gone and the sauce is a light golden brown. Stir in the butter and the peanut butter and sprinkle in a good pinch of salt, to taste. 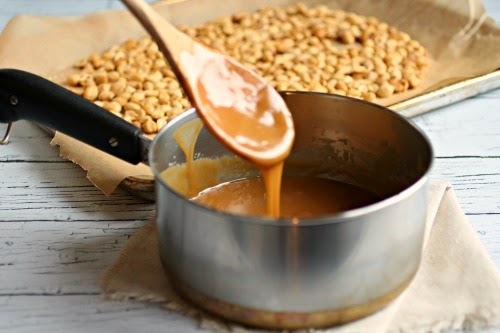 When the baked pie shells have cooled, add about 2 tablespoons of peanuts into each and fill with about 2 tablespoons of the caramel. Refrigerate for a couple of hours to set. Makes 8 servings. Brrrr... those poor, frozen nuts. Maybe I should start knitting them little nut sweaters. By the way, I'm also a cashew whore at parties. Oh my gah... all this naughty talk of nuts and whores. I can only imagine the depth of spam we'll have today! Oh my gosh those look beautiful. Hmmm.....I tried to post a comment but it seems to have disappeared so I will try again. They look lovely and delicious. I love my gooey and crunchy together so this is right up my alley! My son loves anything peanut, this is perfect for him. If I can keep from eating all of that caramel right out of the pan. Did you say caramel??? Pb caramel?!!! What spectacular mini-tarts, Anita! Those must have been some chilly nuts when you rescued them from the freezer. I might add a dollop of whipped cream to this nutty goodness. These are outstanding!! I love everything about them. They look like they come from a high end bakery!! If I saw them in the bakery case they would be my first choice, hands down!!! I freaking cannot wait to try this recipe. It's seriously amazing. I love that you freeze nuts. There's a lot of men quaking in their boots right now at the mere thought of this. i could definitely devour one of these pies right now.. they look SO delicious! This kind of reminds me of a Payday in pie form...which means it must get made immediately. I wish I could just pluck one of these up and take a huge bite because they have my name written all over them! Oh my gaawwddd! I need to make these....immediately!! Anita, you really know how to handle your nuts! Girl, I've been drooling over these ever since you posted a description in the Grab Some Nuts Day group. These are glorious! I wish I had these pies and these nuts in my mouth right now! Oh yum Anita! I'm not crazy about salted dessert but I'd eat one of these in a heartbeat. Oh, and I would eat the peanuts and leave all the almonds. In fact, I have a jar of dry roasted peanuts in my pantry that I've been snacking on when I get those late-afternoon need something to hold me over to dinner cravings. Congratulations for being awesome. These look amazing! How did I not know about this Holiday of all Hollidays? Nuts indeed. There is no better treat in the world than a salty sweet combination IMHO! Pinned.... big time. Oh boy! These look so beautiful! I always keep my nuts in the freezer too! Nothing worse than hauling pecans around the world only to find out they've turned rancid on you. 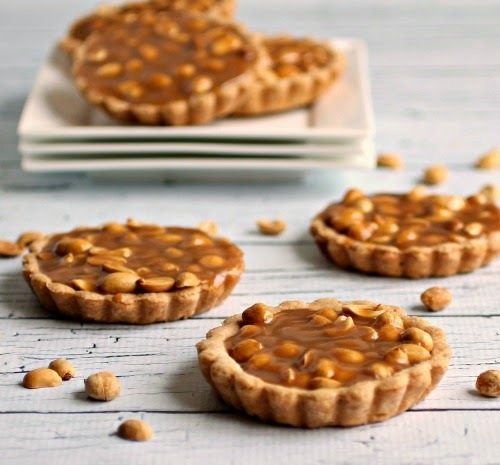 Gorgeous little peanut tarts, Anita! I adore salted caramel - it's one of my few sweet weaknesses. Holy nuts...these peanut pies look delicious! What a clever idea! And I, too, keep an insane amount of nuts in my freezer. Sometimes the ice just has to go to make room for more nuts. #foodbloggerproblems Nice work on these bad boys, though...I want to lick my computer screen right now! Aren't we all a little nuts thought :D I know one thing for sure - I'm nuts for these pies! WHAAAT?? who picks AROUND the peanuts??! Those are what I beeline for! These little pies look fabulous! Thanks for the great recipe! I'm going to try these in the mini filo cups.